Jihan Wu, co-founder of crypto mining giant Bitmain, has argued that ASIC miners make blockchain networks more decentralized – the opposite of what is often argued by members of the crypto community. 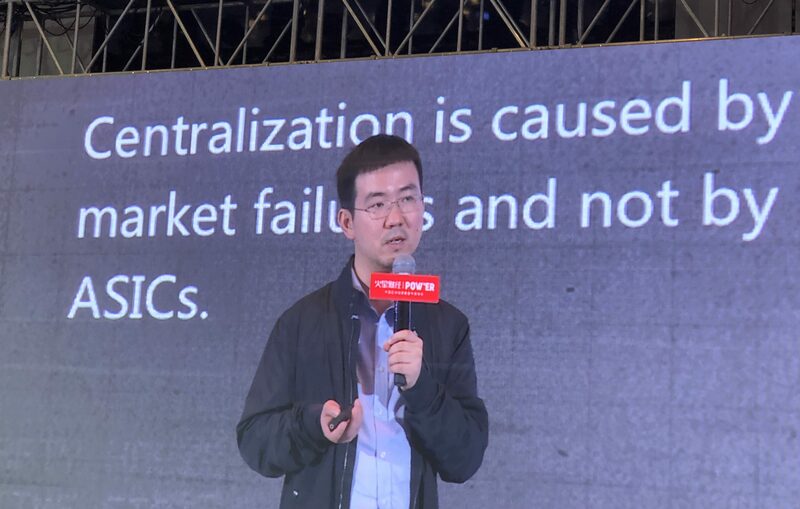 Speaking at a keynote to discuss proof-of-work and decentralization during a blockchain event in Chongqing, China, on Wednesday, Wu told a mix of newbie and experienced participants in the industry that he believes ASIC miners – powerful processors designed for crunching specific algorithms – are less of a centralizing force than more general purpose graphics processing units (GPUs) that are also commonly used in cryptocurrency mining. The discussion also led Wu to cast doubts on ethereum’s ProgPow upgrade (for Progressive Proof-of-Work), which, by altering the network’s mining algorithm, is designed to block ASIC machines and improve the computing advantage of GPUs. Recently, the ethereum community voted to approve the network’s ProgPow upgrade. However, the timeline for activation is not confirmed yet, as a period is needed for auditing the code. It’s a change that, if activated, could have an impact on ethereum’s mining rewards – a market that’s estimated to be worth over $600 million a year. Wu added that the ethereum network is already centralized to some extent, pointing to statistics that two major ethereum mining pools – Sparkpool and Ethermine – together control over half of the network’s computing power. He further cited rumors, without providing any evidence, that certain individuals involved in the ProgPow proposal directly report to the CEO of NVIDIA, a major maker of GPU hardware with a dominant market share. And switching from the proof-of-work algorithm, as used by ethereum currently, to proof-of-stake (supporting a network by holding a stake of its native tokens) will not solve the problem of centralization for ethereum either, Wu contended. If ethereum completely shifts to proof-of-stake, “the entire network will be even more centralized – almost undoubtedly,” he argued. Yet, Wu’s comments on ethereum mining may not be entirely surprising given that his firm, which claims to own about 70 percent of the global crypto mining equipment market share, launched an ethereum ASIC miner in April of last year. And Bitmain once also secured a patent for its ASIC miner equipment design and subsequently sued one of its rivals for IP infringement. The case was dismissed by a local court in China, however, and Bitmain’s patent was revoked as a result. Elsewhere in his speech, Wu also argued that ASIC miners are more capable of making a blockchain network safe than GPU hardware. Because each ASIC is specialized for a certain crypto networks, they bring a high cost bar for bad actors wanting to launch a 51-percent attack on a network.